The M/V Plancius journeys northward on the frozen seas of the Arctic Ocean just 500 miles from the North Pole during my expedition to Svalbard. Sailing along the northerly archipelago and onto the frozen ocean alongside 4 of my photographic idols, Daisy Gilardini, Michael Melford, Chris Linder, and Justin Black was an experience beyond what I could have ever dreamed. Standing beneath rumbling glaciers and towering mountains, watching the midnight sun peek beneath golden clouds, and encountering polar bears on the frozen sea defies all explanation. The aura of nature's raw power and beauty is palpable on the roof of our living planet. Under the soft arctic light, a golden figure emerged from the distance - a polar bear, venturing between the turquoise and sepia pools of melted sea ice as she neared the ship with an adolescent cub close behind. My heart raced as I witnessed the indescribable beauty of a healthy mother bear living peacefully on the frozen seas of the far North. Encountering such a thriving polar bear was a relieving sight given the state of the sea ice this year; a character in the Arctic story with whom nearly every creature depends. At 80°N latitude, the northernmost land in Svalbard is rarely far from the sea ice, but after a particularly warm winter and summer this year, we encountered this bear with her cub all the way at 82°45N - more than 150 miles away. 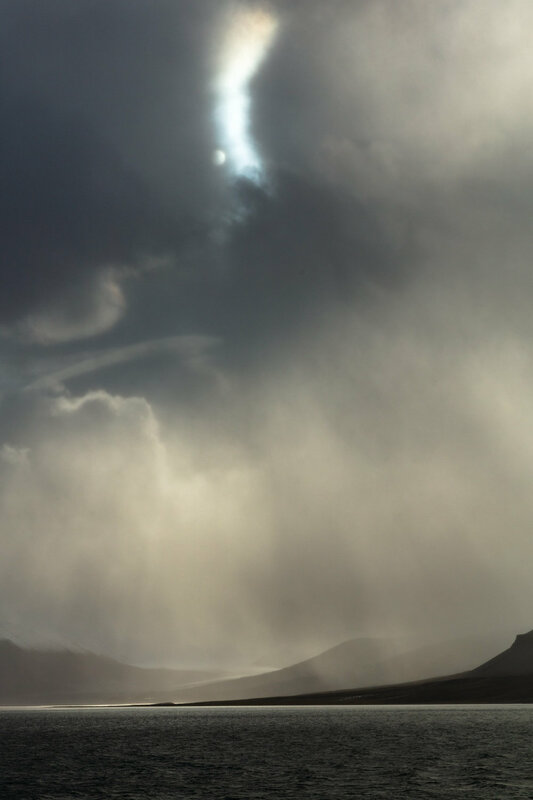 An isolated beam of sunlight peeks through a small hole in a heavy rainstorm, illuminating the barren hillsides of Svalbard's north coast like a golden spotlight. There is something magical about the late-summer light in the high arctic. The sun never fully sets, but rather circles the horizon, creating a sunrise and sunset that lasts all day. Just minutes before, in the thick of the torrential rainstorm, the landscape appeared dark and colorless. As the sun made its brief appearance, I stood in awe as one of the most vibrant scenes I have ever witnessed emerged from the darkness. A piece of glacial ice slowly melts, carved into sculptural form by the shimmering arctic sun. When the sea ice retreats north in the summer, glacial ice is all that remains in the waters around the archipelago of Svalbard - but even this ice may soon disappear. Icebergs are formed when glaciers push down mountainsides and "calve" large chunks of ice into the sea, but this process only occurs when glaciers are large and healthy enough to reach sea-level. It is normal for glaciers to retreat through the summer, but the retreat would ordinarily be met with an advance during the long arctic winter. 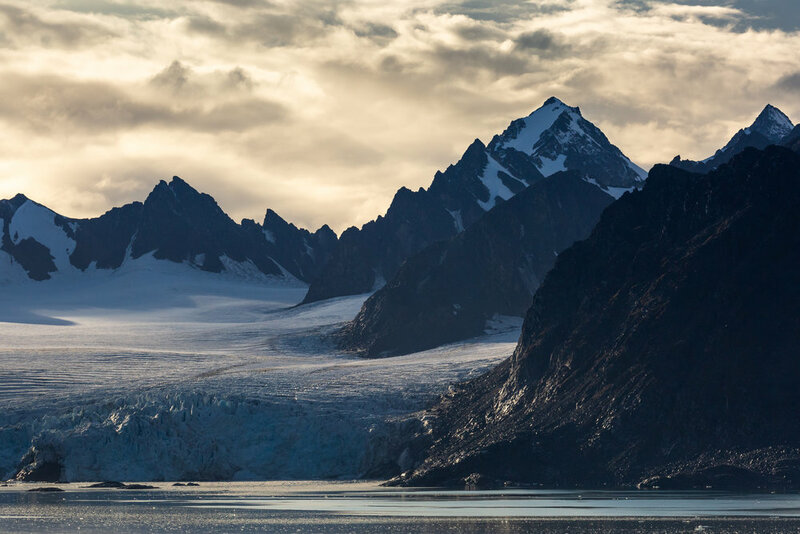 As climate change takes hold, however, the summer retreat out-scales the winter advance, resulting in glaciers that are rapidly melting and disappearing into the distant mountains. A mother polar bear guides her yearling cub among the vast islands of blue and gold ice that make up the edge of the frozen Arctic Ocean at 82°46 N. During her 30 months of motherhood, the mother bear will teach her cub how to survive and hunt in the harsh conditions of the far north. Seeing such a healthy mother and cub this year despite the poor sea ice conditions is a relieving testament to the mother's ability to care for her young in even the most difficult of circumstances. 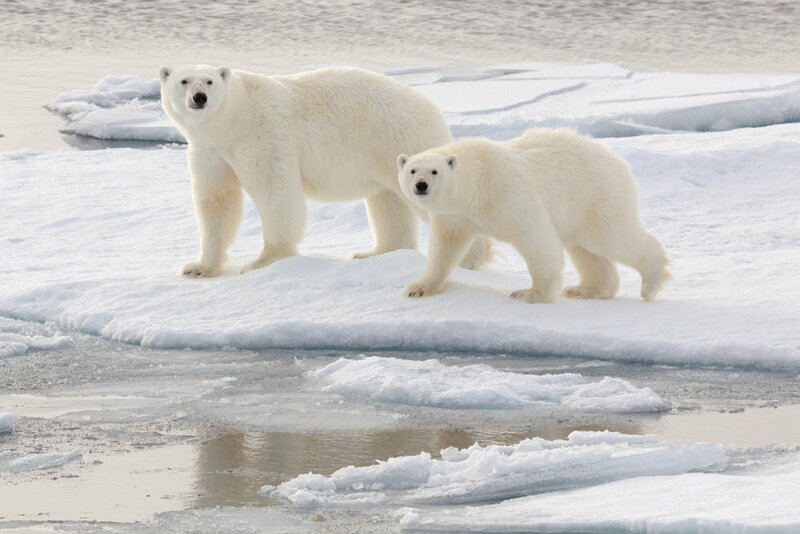 This mother and cub are among the lucky ones who were able to follow the ice as it retreated far north this summer. As sea ice becomes less reliable in the warming arctic, polar bear motherhood is increasingly a monumental challenge. Without sea ice to hunt on, a polar bear mother cannot provide enough food to care for her young, making it crucially important for people to ensure the rapidly approaching future of an ice-free arctic never comes. The deep blues and bright whites of a glacial iceberg appear to glow in the soft arctic light. Few objects in nature are quite as vibrantly colored as glacial ice. The varied tones and shades of blue create mesmerizing textures and shapes as sunlight melts its way through the frozen form. Glacial ice appears blue because of the extreme compression the ice goes through, creating a form so dense that blue light cannot enter and is reflected outwards. As icebergs are exposed to sunlight (sometimes for the first time in thousands of years) the blue fades to white as the sunlight and warm air break-down the frozen structure. The magical blue color of glacial is only visible for a fleeting moment in time as the ice slowly melts into the sea. A group of Black-Legged Kittiwakes soar above the stark white expanse of the frozen ocean, searching for small fish in the rich waters beneath the icy surface. Though the sea ice may appear as a barren wasteland, a garden of life is hidden beyond view. Upon a closer look, the ice is home to one of the most vibrant ecosystems on the planet. Specialized photosynthesizing plankton (phytoplankton) depend on the ice for habitat and nutrients, just as a land-based plant uses soil. These phytoplankton form the basis of an entire food web that supports the fishes, birds, bears, and other wild creatures that have adapted to life on our planet's northern cap. Caring for the sea ice in the arctic means more than just saving polar bears. It means protecting one of the most miraculous ecosystems on earth. When many imagine sea ice, people think of a towering mass of ancient and thick ice - like a giant glacier floating on the ocean. In reality, however, much of the sea ice is a fragile mix of these thin “islands” that merge or break as they float on the surface of the Arctic Ocean. As the Arctic warms, an increasingly small portion of the ice lasts longer than a single year. The summer breakup and melt now clears most the ice formed the previous winter - and more. Sea ice is dynamic, making it especially fragile in the face of climate change. Like a dance, the ice is constantly in motion as the tides shift, winds blow and the hot sun shines 24 hours a day. 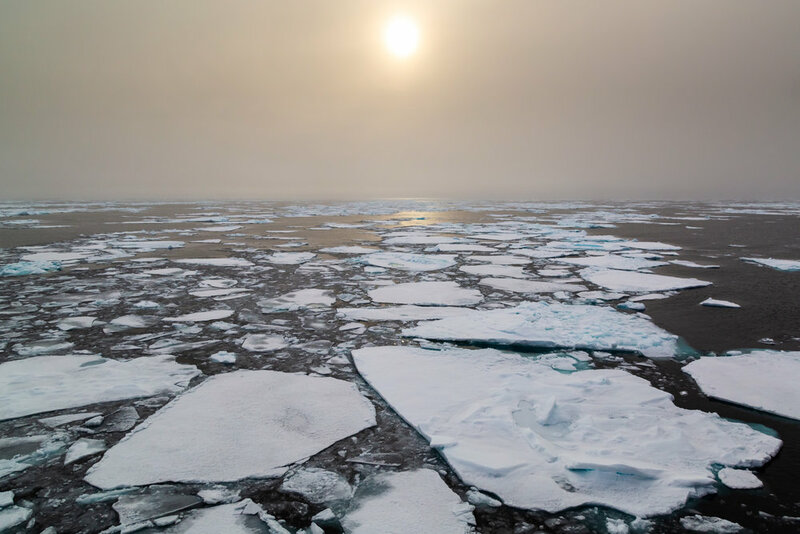 The summer area of sea ice is 40% less than it was just 30 years ago and is heading towards a complete summer disappearance in as little as 20-30 years - but it is not yet too late to save the sea ice. I make pictures and share stories not to serve as a memory of what we could soon lose, but rather to give you all a reason to care about fragile natural worlds that could disappear if too many of us fall into the trap of complacency. If enough people care, I believe anything is possible. A mother polar bear keeps watch of her surroundings, ensuring the safety of her curious yearling cub as they navigate floating patches of ice. Sharing a peaceful moment on the ice with this mother and cub is a memory that will stick with me forever. Moments like these, I could never take for granted, especially as the future of polar bears rests on thin ice. 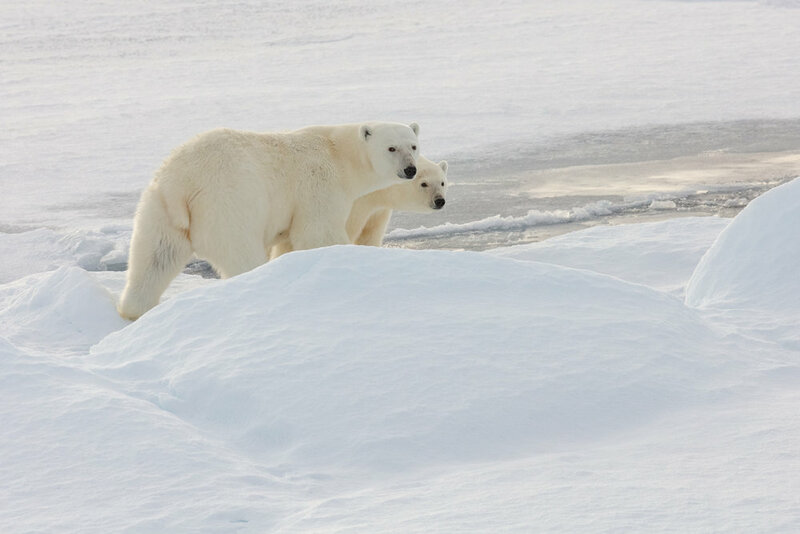 Nothing quite compares to the display of wilderness that is the ice bear of the Arctic. The fact that the largest bears on the planet live among the constantly shifting sea ice in the middle of a frozen ocean is a marvel of nature that is hard to comprehend. It is no wonder that polar bears are the charismatic ambassadors of the climate story. Looking into the eyes of these wondrous animals has the power to inspire wonder for the unique world that we all call home. A female polar bear gracefully crosses a large crack in a floating slab of ice on the frozen ocean. The difference in reflectivity between areas of bright white on the ice and the deep black sections of open ocean are vitally important to the climate system. Ice can reflect light and heat from back out into space, moderating the climate of the entire planet. The more area that is dark ocean though, the more heat is absorbed on earth and the faster warming occurs. The struggle of polar bears and sea ice may feel like a distant, separate and invisible from our daily lives, but the earth is an intertwined system. The impacts of what happens in the Arctic matter around the globe just as our footprints around the globe will dictate the future of the Arctic. The soft arctic sun peers along the edge of a storm-obscured lenticular cloud formation, illuminating it with a silver bolt of light above the shadowy tundra below. The morning began dark and gloomy with heavy winds, fog, and rain that hid the fjords behind heavy weather. As the storm cleared for a few brief moments, the clouds, landscape, and sea were bathed in sepia-gold rays of light. Waves slowly glide along the surface of the arctic ocean, reflecting a purple glow from the endless sunset of an arctic autumn night. As the ship sailed through near-freezing seas, the ocean began to appear different. Bubbles in the water seemed to move sluggishly and I almost felt like I could see the heaviness of the waves as they crashed along the ship's sides. As water nears freezing, it reaches its densest and heaviest point, sinking and creating the currents that moderate the climate from the poles to the equator. But the miraculous thing about water is that after becoming ice, the density decreases. It is entirely possible that life in the arctic would not exist without this quality of water that makes ice float rather than sink to the seafloor. If ice sank, the entire ocean would freeze from the bottom to the top, making life impossible for marine species and the other species like bears and birds that depend on that marine life to survive harsh conditions of the far north. A strip of light falls on the mountains along the still waters of Isfjorden near Longyearbyen, Svalbard’s primary settlement. Before embarking on the ship, I had a few hours to explore the town. Just 10 minutes before I had to catch the only bus to the ship, I looked behind me and spotted this strip of light moving towards the snow-capped mountains. With no time to spare, I began to run to reach the water and make it back before being left behind. When I reached the shoreline, I stopped cold. The fjord was so still that I felt as though I was standing at the edge of the sky. I quickly made this image and then glanced down at my watch again. 3 minutes left... I broke out into a full sprint, struggling to keep pace as my heavy camera gear bounced on my shoulders. With just seconds to spare, I leaped onto the bus just before they closed the doors. I sat down exhausted, but as I looked at the image on the back of my camera, I knew it was worth it. A large female polar bear stands on her hind legs, curiously observing the ship far in the distance. Weighing as much as 500-600 lbs, female polar bears look like giants on the ice, but when standing at over 7 feet tall, their size and strength is even more humbling. Though this bear was curious about the ship for a brief moment, she quickly returned to her normal hunting behaviors and was calm as if the ship were not there, making it possible to observe the bear on her own terms without disrupting her way of life. In the arctic, just as anywhere else, it is crucial to ensure that the presence of people does not impact wildlife or leave a lasting footprint. The M/V Plancius and its crew from Oceanwide are governed by an organization called AECO that sets guidelines and ethical standards for ensuring encounters like this one lead to a positive impact for the species of the arctic, not a negative one. A blue iceberg drifts out to sea along the mars-like tundra of Northern Spitsbergen. Today, the archipelago of Svalbard is located just a few hundred miles from the North Pole, but this was not always the case. When these brilliant red sandstones formed 400 million years ago, the original land mass that would become Svalbard was nearly at the equator, 6000 miles south. Newly formed mountains were eroded by rivers that flowed through the once hot desert climate and the sand and mud deposited, compressing and forming stone. Though Svalbard has seen many changes along its slow journey northward, the modern geological changes are now driven by humans rather than the natural forces of nature. As the climate warms, the rapid disappearance of ice is exposing the barren rocks of Svalbard once again, possibly for the first time in thousands of years. A black-legged kittiwake flies among the jagged cliffs of Alkefjellet in Northern Svalbard. The cliffs and spires which rise like skyscrapers 350 feet out of the Arctic ocean, are one of the most important bird nesting habitats in the archipelago. Though a sheer cliff may seem like a strange place for any creature to make its home, the colorful and steep basalt columns provide guillemots, kittiwakes, and gulls with a nesting habitat that is inaccessible from possible predators like the egg-loving Arctic fox. Each summer, the cliffs come to life with birds as 60,000 guillemots and thousands more of kittiwakes and gulls fill every ledge and nook of the small, glacier encircled cliff-band. A Svalbard Reindeer rests atop a mossy ridge-line, overlooking the arctic ocean nearby. As the days shorten and the icy arctic winter approaches, reindeer shed their grey/brown coat and for a fluffy white coat that helps them survive as the northernmost herbivorous mammal in the world. Svalbard Reindeer look like something out of a children's book with their big eyes, round fluffy bodies, and short stubby legs. They are the smallest of all reindeer with a weight that is nearly half of the other sub-species. With no natural predators, they are incredibly friendly and docile animals which was their greatest downfall in the early 1900s when they were nearly hunted to extinction. After 1925, however, the sub-species gained legal protections and has since rebounded throughout the islands of Svalbard. The jagged migmatite mountains of West Spitsbergen rise 1000+ meters above the ocean, peeking out like a crown atop the giant glaciers below. Seeing glacier filled valleys between peaks where glaciers are still present always changes the way I see the Teton range back home. Though the glaciers are mostly gone from the Tetons today, it is fascinating to look at the giant bowls and U-shaped valleys and imagine the icy world that filled the famous range during the last glacial maximum 20 thousand years ago. A yearling polar bear cub peeks out from her protective mother as they cross the sea ice in search of seals. Within an average lifespan of between 15-30 years, this polar bear cub and others in her generation may face a very different Arctic landscape. By some scientific estimates, the Arctic ocean could be ice-free within the lifetime of this young cub. Getting humans to act on climate change is one of the greatest challenges of our time because climate change is often talked about in the future tense despite the fact that actions to mitigate changes are needed in the present. When challenges feel distant and overwhelming, people often respond with complacency as a way to cope. Yet in places like the Arctic and increasingly around the globe, our impact on the planet is having immediate and drastic implications in the present that are breaking records and outpacing predictions.